This is a great starter kit or replacement kit for crafters, scrapbooking and card making. If you haven't tried embossing, you want to get started right away. Imagine how impressed your friends will be when they see the beautiful work you have created. Now you can add that professional touch and even impress yourself! 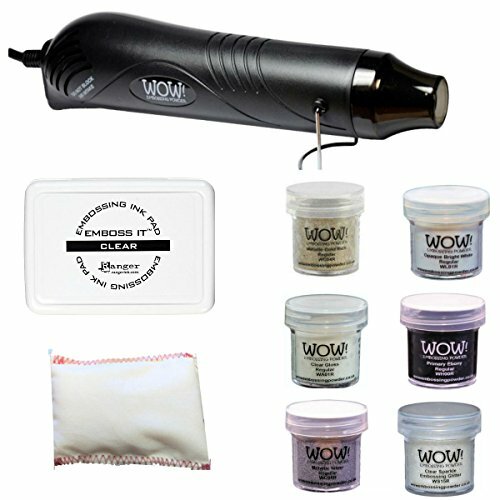 You will have 6 embossing powders a ink foam pad and an anti static pad so you don't waste any of your powders. Add to that a fabulous heat gun to set your embossing powders and your projects will come to life. Great value. Bye Bye Static custom made pad eliminates the problem with embossing powders-Stray particles on your artwork. Simply dab or wipe this pad on your work prior to stamping, and all the extra embossing powder will come right off. No wasted powders. If you have any questions about this product by Big Dream Arts and Parties, contact us by completing and submitting the form below. If you are looking for a specif part number, please include it with your message.